iTimeTrack (previously called Webolize TimeTracker) is a downloadable web application that tracks time and issues for multiple projects. iTimeTrack is installed on Windows (XP & Vista) and accessed by multiple users using a web browser. 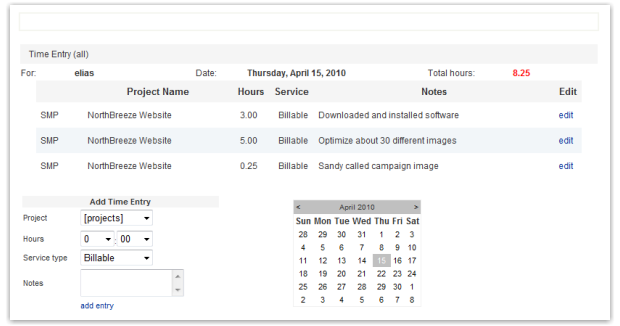 Whether you are a consultant, freelancer or designer, iTimeTrack will help you track time for multiple projects/jobs for multiple clients that you and coworkers/contractors work on; manage project costs. Qweas is providing links to iTimeTrack 2.0 as a courtesy, and makes no representations regarding iTimeTrack or any other applications or any information related thereto. Any questions, complaints or claims regarding this application iTimeTrack 2.0 must be directed to the appropriate software vendor. You may click the publisher link of iTimeTrack on the top of this page to get more details about the vendor.